The Royal Canadian Mint’s 2009 Silver Dollar was in the spotlight Monday as a part of National Aviation Day in Baddeck, Nova Scotia. The coin is a reminder of Canada’s first flight of the Silver Dart, which occurred 100 years ago on Feb. 23, 1909 over a frozen lake in Nova Scotia. 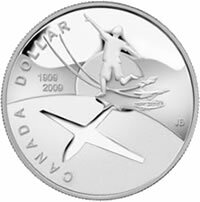 The mint designed the silver coin to commemorate the anniversary with scenes of the Silver Dart, the Avro Arrow and a “Snowbird” Tutor Jet all behind an image of child whose arms are spread like an airplane’s wings, symbolizing humanity’s timeless dream of flight. "The Royal Canadian Mint is passionate about celebrating defining moments in Canadian history and the centennial of the first powered flight in Canada is an event which deserves permanent recognition on a beautiful new silver dollar," said Ian E. Bennett, President and CEO of the Royal Canadian Mint. "The Mint’s 2009 Silver Dollar also salutes the efforts of the tireless organizers and volunteers celebrating our nation’s centennial of flight in Baddeck, and across Canada." Additionally, the same design is reproduced on a selectively gold-plated proof dollar coin, which is exclusive to the Mint’s 2009 Proof Set and is limited to 55,000, according to the Mint’s press announcement. The Royal Canadian Mint is the Crown Corporation responsible for the minting and distribution of Canada’s circulation coins. An ISO 9001-2000 certified company, the Mint is recognized as one of the largest and most versatile mints in the world, offering a wide range of specialized, high quality coinage products and related services on an international scale.